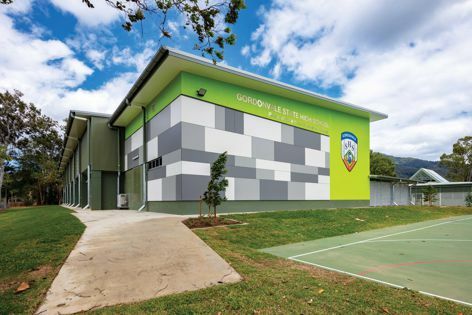 Architecture firm Clarke and Prince specified Cemintel’s Surround for this school in Gordonvale, Queensland. Photography: Brad Newton. The Surround range by Cemintel allows for colours and textures to be mixed and matched to meet the given design intent. The prefinished fibre cement panels are colour bodied, which means they have a natural appearance and real depth of colour. The range is available in five base colours, ‘Whiteish,’ ‘Greyish,’ ‘Blackish,’ ‘Greenish’ and ‘Blueish.’ Each of these colours comes in five different textures, and can be complemented by a further 12 colours in the ‘Secondary’ palette.